Iftest has more than 100 man-years of experience in PCB design. Comprehensive manufacturing technology expertise is also essential in realising complex layouts. This forms the basis for subsequent cost-effective manufacturing of high quality products. 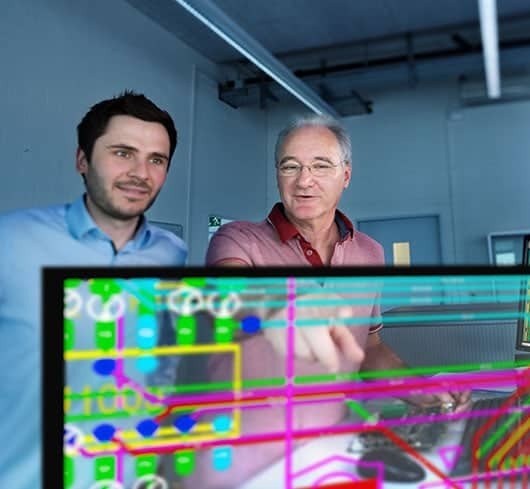 Many times customers leverage Iftest know-how for printed circuit board design in order to focus their internal ressources on core competencies such as product development. Many medetech products require fast data processing. A high speed design needs to be developed for such products. Many times this requires a large layer stack-up. Impedance, reference face, electromagnetic compatibility (EMC), radiation safety requirements lead to a limited selection of components. Furthermore, the option to autoclave the finally assembled product as well as conformity with respect to regulatory guidelines such as ISO 13485 are further important requirements that affect product design in the medtech use case. The challenges for smartwatches include a degree of miniaturization in all three dimensions. In addition, low mechanical tolerances need to be met that come from the watchmaking industry. Furthermore, large quantities up to >100’000 per year are required. The development of a PCB design needs to be well aligned with the manufacturing process. The solution for smartwatch electronics consists in a product design which is optimised in terms of cost efficiency by developing a novel manufacturing process. For starrflex and flex applications also a high level of miniaturization and production quantities are required. The design goal is to pack as much functionality as possible into a small volume. Interconnectors as well as wiring shall be minimised. As a result, a printed circuit board design is developed that is optimised in terms of compactness. Optimisation of product concept in terms of design for manufacturing, design to cost etc. After finalising PCB design, rapid prototype manufacturing is an essential element in every industrialisation project. Fast prototyping allows customers to quickly carry out verification and validation testing. Iftest specialises in rapid and efficient prototyping through its in-house dedicated prototyping manufacturing line and team.